This new page is being developed to share information on local infrastructure. 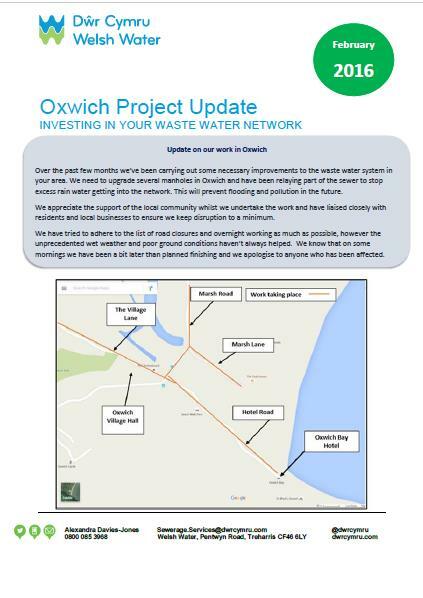 Problems with the Oxwich sewer are now being tackled but there is disruption locally whilst works are being carried out. Potholes are an ongoing problem which the Community Council reports to the Highways Authority on a regular basis. 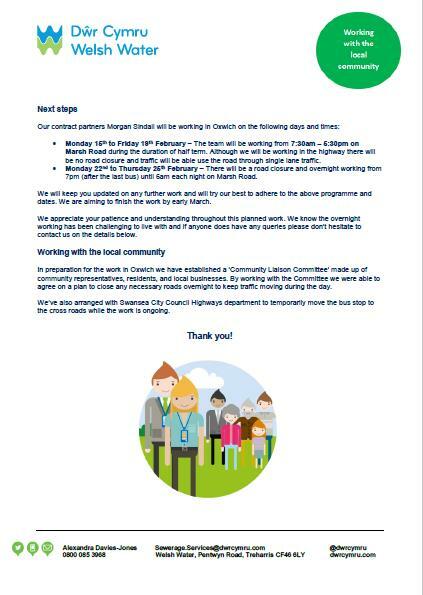 DCWW should complete the first phase of the sewer works by Tuesday 19th April and the situation will then be monitored for a period of time to see whether all related problems have been resolved. A separate issue with the capacity of the remaining gullies and drains for surface water run-off in the vicinity of the bus stop has recently been raised. Dwr Cymru Welsh Water have completed the planned works on the Oxwich Sewer. Some additional relining, repairs and man hole rehabilitation will be carried out after the Easter break over the two weeks commencing Monday 4th April 2016. There will still be some disruption to traffic until this is complete. Dwr Cymru Welsh Water will also be monitoring how the sewerage system is functioning with this upgrade to discover whether any additional works will be required. Dwr Cymru Welsh Water Oxwich Update for planned works into early March 2016. Dwr Cymru Welsh Water Oxwich Update for planned works to 25th February 2016. Due to the exceptionally wet weather and resultant high water-table, the contractors have not been able to progress the work as fast as planned. Night work is likely to continue until at least 12th February, and probably longer. For the rest of February, there should be half the road open with work being undertaken in the day, near the bus-stop. 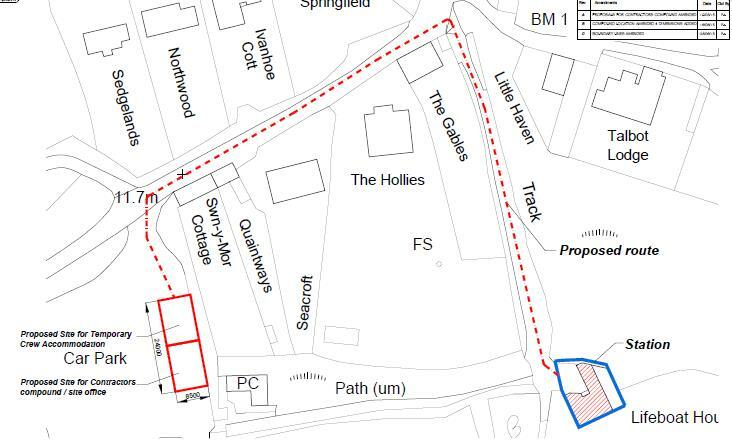 After 18th February, if the water-table has dropped a little, there will be short-term ( a few hours) blockages during the day of the lane through Oxwich village, to allow work to individual manholes. When work is underway at night or to the manholes during the day, diversions may be necessary using The Pennyhitch via Penrice, or using Rocks Lane (Greenways to Badgers End). 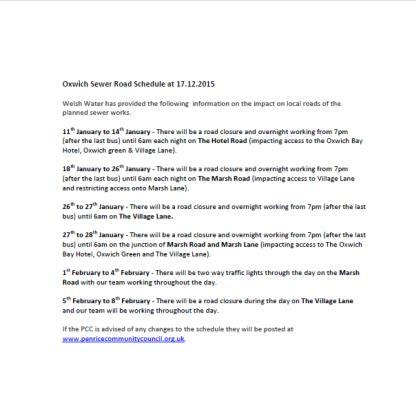 There are planned works which will affect the roads in the village on the following dates. Please see the full details in this Oxwich Sewer Road Schedule at 17.12.2015. During the winter of 2015 to 2016 the RNLI is extending the Lifeboat Station in Horton on land provided by Penrice Community Council. 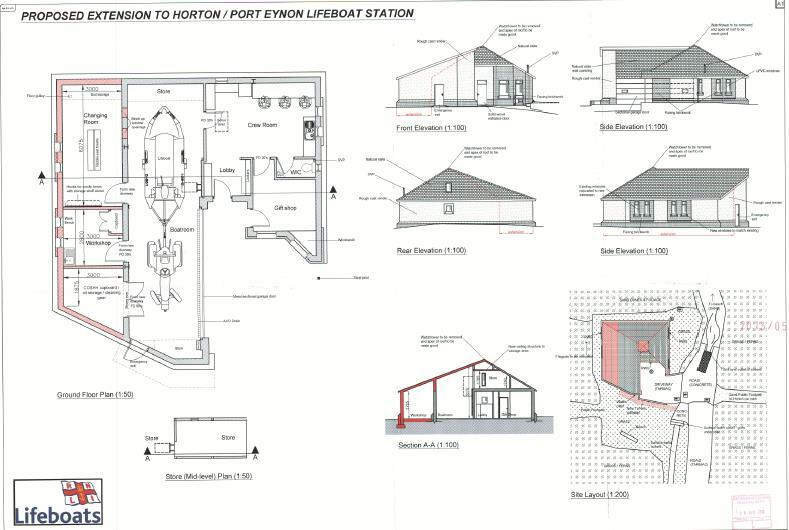 The proposed building and the temporary arrangements for the lifeboat are shown in the planning documents below.